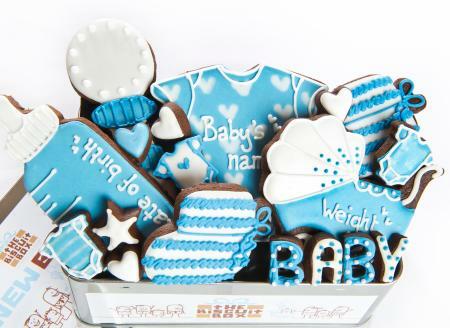 A beautiful tin of hand iced biscuits perfect for a new arrival. 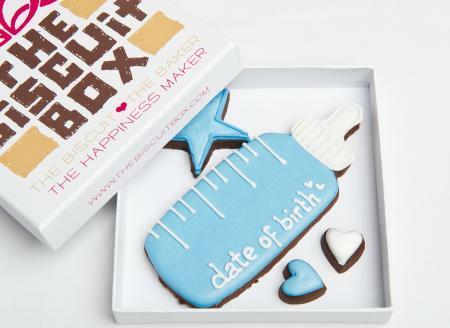 Personalise up to three biscuits with the baby's name, date of birth and weight for a truly unique gift. This tin contains approximately 18 biscuits of various shapes and sizes all displayed over three layers and presented in our New Baby Boy Tin. A beautiful tin of hand iced biscuits for a new arrival. 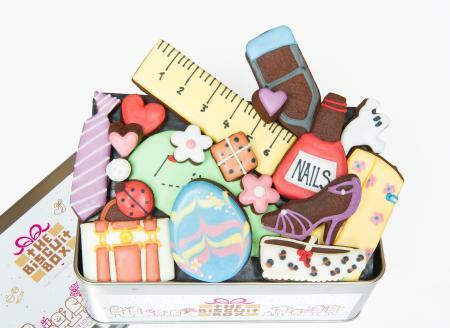 You can personalise up to three biscuits in this tin to make it really special. 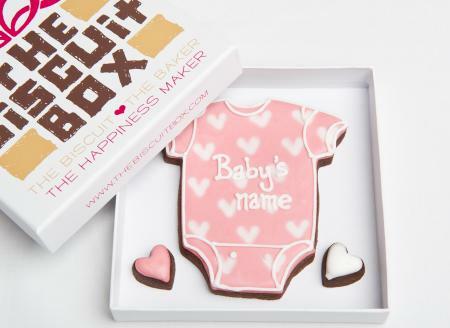 Enter the baby's name, date of birth and weight for a memorable gift. 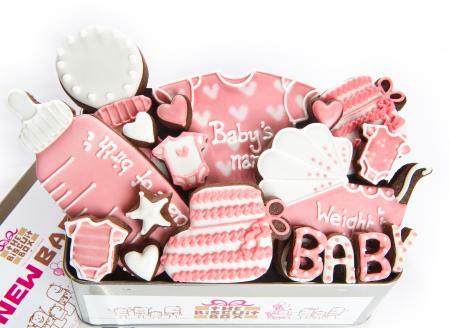 This tin contains approximately 18 hand iced biscuits of various shapes and sizes all displayed over three layers and presented in out New Baby Girl Tin. 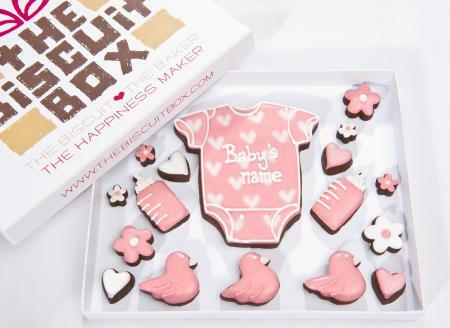 Celebrate the arrival of a new baby with this gorgeous biscuit box packed with cute baby themed biscuits. Personalise the baby vest to make this gift unique. This box contains approximately 17 biscuits of various shapes and sizes, all presented over one layer and packed into our branded biscuit box. 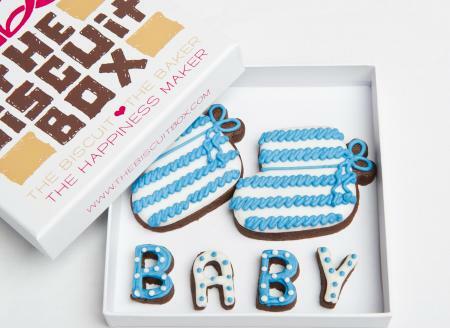 This biscuit box makes a yummy gift to welcome the arrival of a new baby boy. Personalise the baby vest with the new baby's name to make an extra special gift. This Box contains approximately 17 biscuits of various shapes and sizes all displayed over one layer and presented in our branded biscuit box. 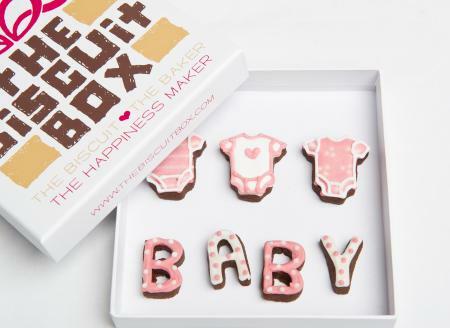 Send this biscuit card to congratulate someone on their new baby. A yummy chocolatey biscuit hand iced with the baby's name. 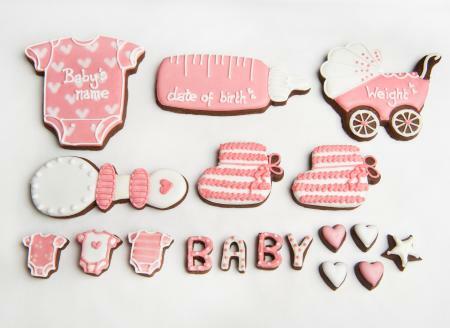 These biscuit cards are also great for baby showers, personalise with the Mum-to-be's name and shower date. 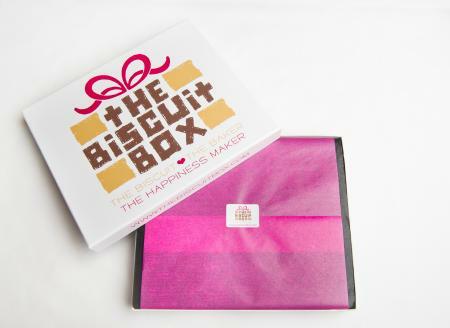 Your biscuit card will come beautifully packaged and tied with ribbon. A yummy treat for a new parent. 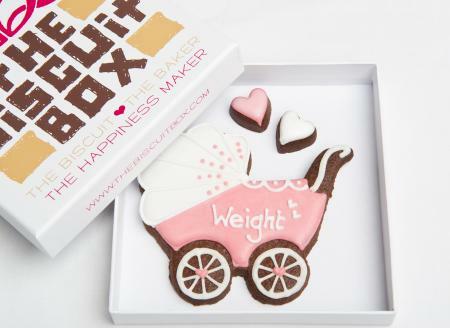 Personalise this biscuit with the baby's name for a really unique gift. 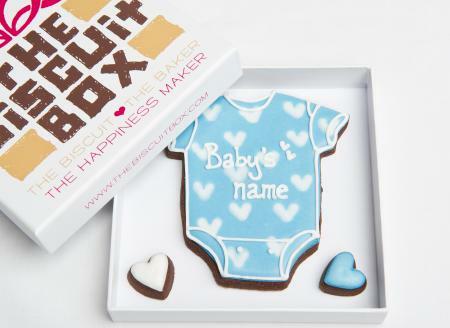 This biscuit card can also be used as great baby shower favour, personalise it with the Mum-to-be's name and shower date. 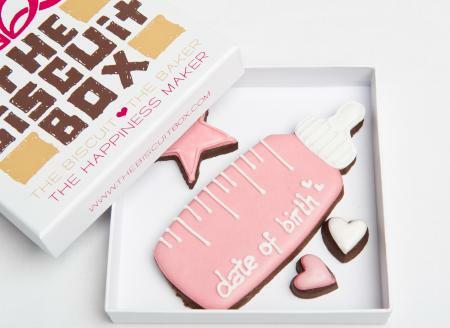 This biscuit card contains approximately 3 biscuits of various shapes and sizes displayed over one layer and presented in our biscuit card box. 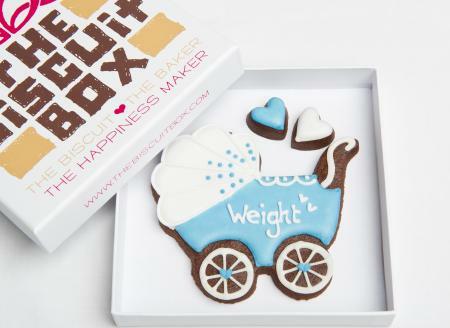 A gorgeous pram biscuit that can be personalised with the baby's name or weight. 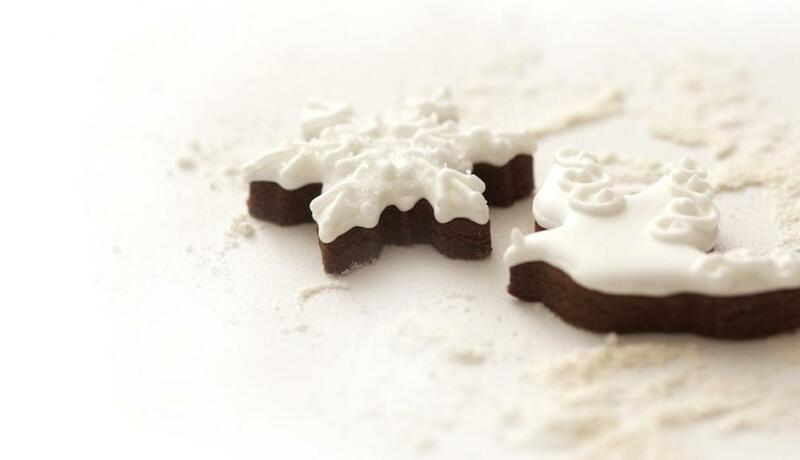 Hand iced on our chocolatey biscuit, it makes a great gift. 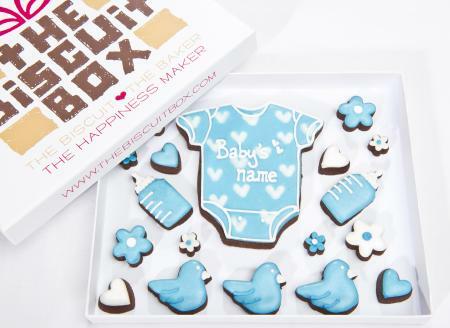 A gorgeous pram biscuit that can be personalised with the baby's name or weight. 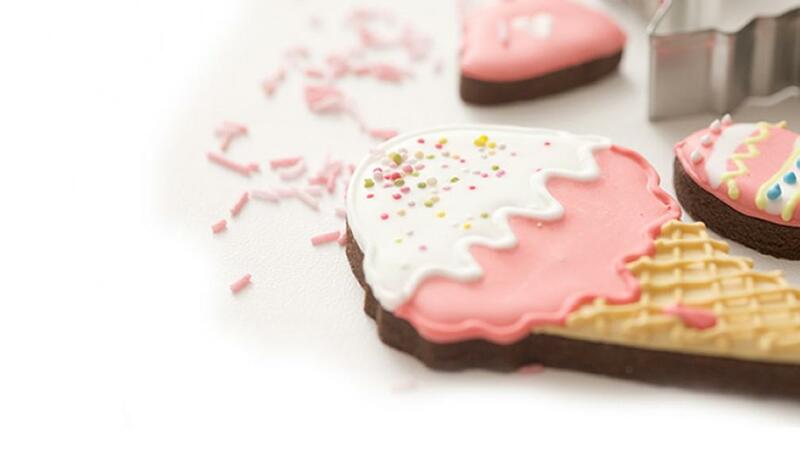 Hand iced on our chocolatey biscuit it makes a great gift. This adorable baby bottle is hand iced on our super chocolatey biscuit and can be personalised with the baby's name or birth date. A unique gift to celebrate a new arrival. This biscuit card contains approximately 4 biscuits displayed over 1 layer and packaged in our branded biscuit card box. This adorable baby bottle is hand iced on our super chocolatey biscuit and can be personalised with the baby's name or date of birth. A unique gift to celebrate a new arrival. 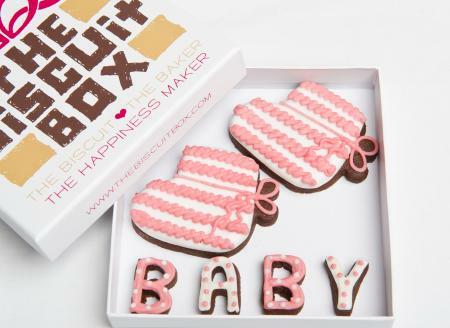 These adorable biscuit booties make the perfect gift. 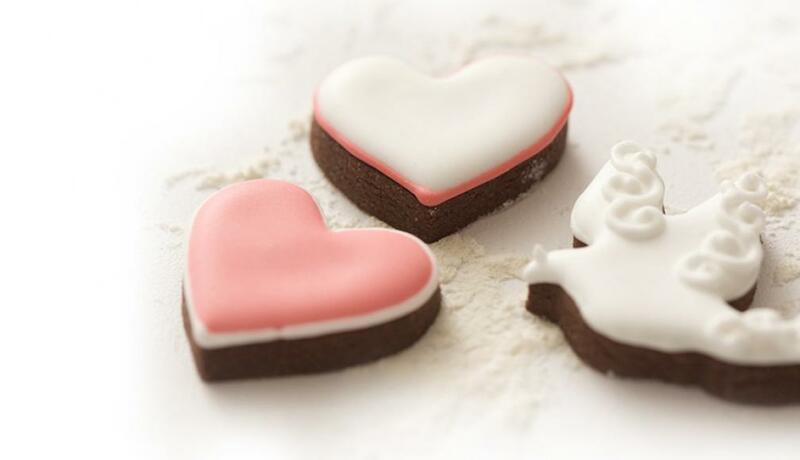 Our super chocolatey biscuits are made from the best ingredients so they not only look fab they taste fab too! This biscuit card contains approximately 6 biscuits of various shapes and sizes all presented over one layer and displayed in our biscuit card box. 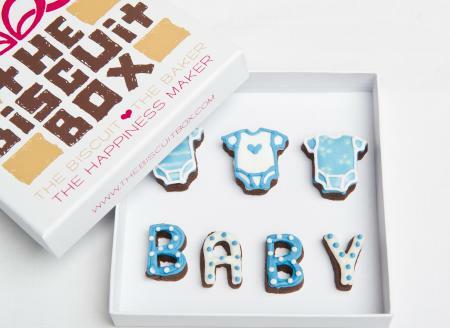 Send these edible booties to congratulate someone on their new arrival. 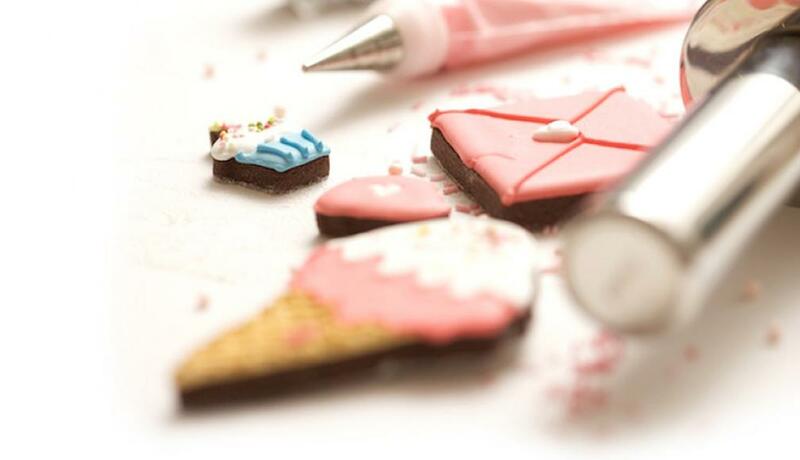 Hand iced and super cute, they are sure to bring a smile to anyones face. This biscuit card contains approximately 6 biscuits all displayed over one layer and presented in our biscuit card box. 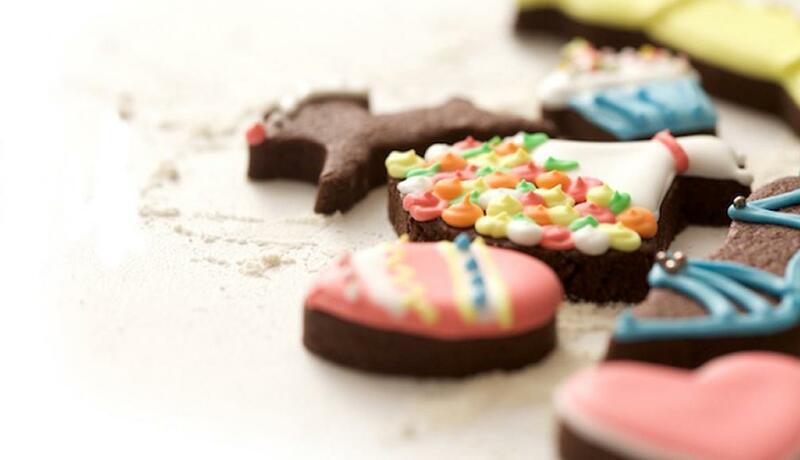 The trio of mini vests in different patterns are almost too good to eat, that is until you open the box and smell their chocolatey yumminess! 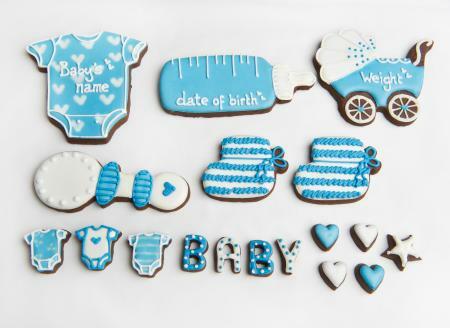 A perfect gift for a new arrival or a great baby shower favour. 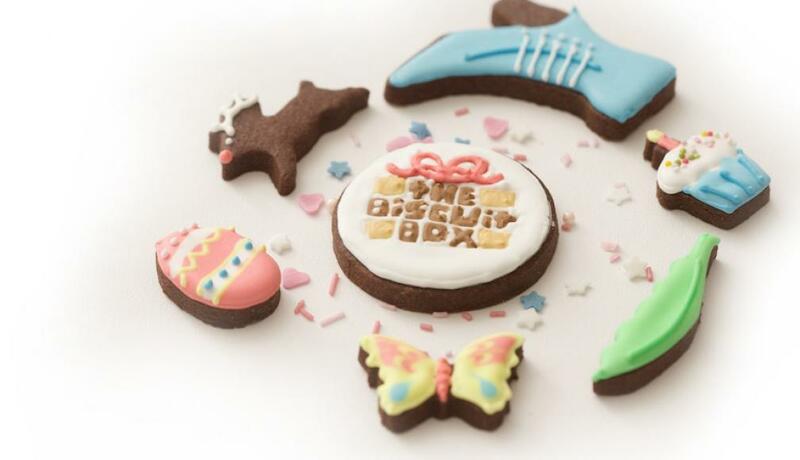 This biscuit card contains 7 biscuits all displayed over one layer and presented in our biscuit card box. These cute baby girl vests are the perfect gift for a new arrival or a favour at a baby shower. 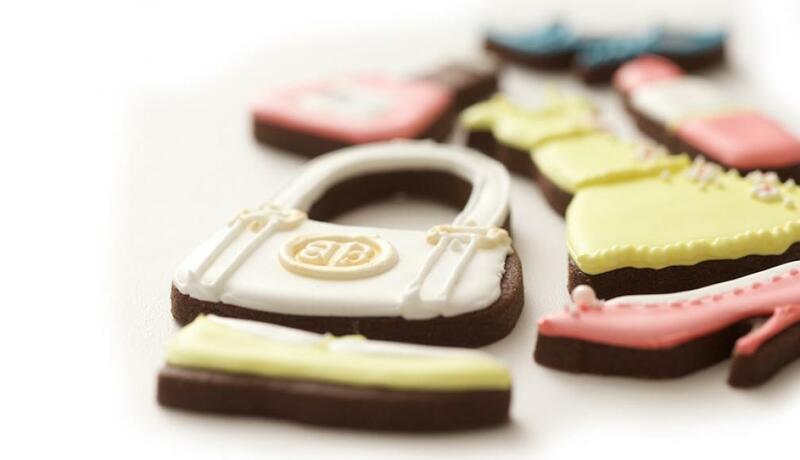 Beautifully packaged and tied with ribbon they are a yummy alternative to a card or teddy!